Aaron Sanyasi, 3, tries out his new convertible car seat after Heather Trnka, injury prevention coordinator for Akron Children’s Hospital, showed his mother, Bali, how to correctly install it and check it for a proper fit. Three-year-old Aaron Sanyasi left Akron Children’s Hospital sitting a little bit higher and whole lot safer in a new car seat. With the help of translator Singh Rai, Aaron’s mom, Bali, left with all the information she needs about local traffic laws, how to install a car seat and how it will keep Aaron safe. 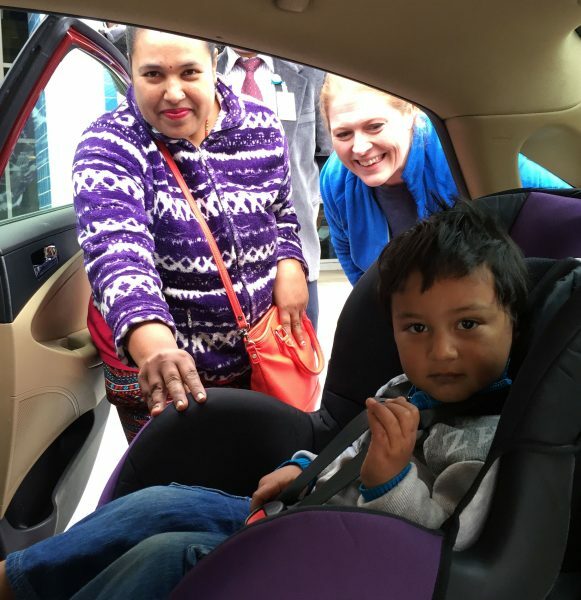 They were among the 22 Nepalese families living in Akron invited to the car seat clinic made possible by the Safe Mobility Project. Announced earlier this year, the Safe Mobility Project, supported by The Goodyear Foundation, aims to prevent mobility-related injuries for children, as uses Goodyear associates as volunteers. A clinic for refugees from Karen language-speaking countries, such as Myanmar, was also planned. The Safe Mobility Project will enable the hospital to offer 450 car seats each year for 3 years to families in need. The hospital also plans to hold car seat clinics in the neighborhoods where many of Akron’s refugee families live.